Pastry Chef Brooks Headley of Del Posto shares recipes for an Italian savory and sweet dessert and lemon granita as part of the New York Culinary Experience hosted by New York magazine and The International Culinary Center. 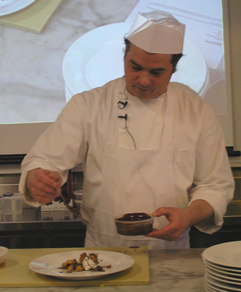 With an interest in desserts and especially Italian desserts, I was especially intrigued to attend Pastry Chef Brooks Headley's Classic Italian Desserts Refined class at the New York Culinary Experience at The International Culinary Center. I heard about the creative desserts being served at Del Posto, so the opportunity to participate in a 2+-hour class to work hands-on with Chef Headley was high on my list. 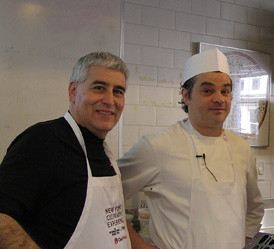 On April 29, 2012, I attended the "Classic Italian Sweets Refined Class" with Pastry Chef Brooks Headley and Pastry Sous Chef Roger Rodriguez who opened up their cookbook and shared some ‘refined' recipes. A true hands-on class, we sliced, cracked eggs, mixed, cooked, baked, and tasted for more than 2-hours; what a delightful time it was, and what great desserts we made. Chef Headley moved his creative energy from music [drummer in a punk rock band] to cooking at the age of 27. With a unique understanding and appreciation for working with pastries, he traveled across the United States gaining experience while peaking his interest along the way. From Washington, DC through Los Angeles, back to DC, and on to New York, he has worked with some of the top pastry chefs in the country. When he heard about the opportunity at Del Posto and the chance to work with Executive Chef Mark Ladner within the Batali-Bastianich family, he leapt at the chance. During his travels, he became known for creative renditions of classic desserts, as well as he was a finalist in the Pastry Scoop Golden Scoop Awards in the national category of "Best Dessert Menu." 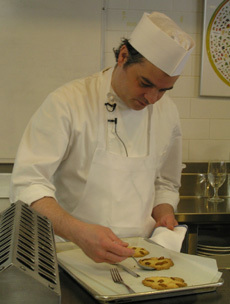 His off-the-cuff style is complemented by his creative renditions of desserts and his methods used within his recipes. Whenever I thought the next step would be done in a traditional method, like forming cookies on a cookie sheet, he put a twist in the process that yielded a refreshing result both visually and on the palate. Method: Peel eggplant and slice thinly. Coat both sides in olive oil and season with salt. Grill on both sides, just to soften. Method: Preheat the oven to 325° F (163° C). Place the flour and sugar in a mixing bowl and add the wet ingredients (eggs, cream, zest). Mix together by hand until you have a crumbly-textured dough. Portion the dough using 5.5. inch ring molds, top with the toasted almond halves. Bake for 12 minutes. Method: Combine equal portions of honey and white wine vinegar, season to taste. Method: Melt chocolate over a double boiler. When chocolate has cooled but is still melted, whisk in olive oil and season with salt to taste. Method: Stir all ingredients together; taste and adjust seasoning. To Assemble: Brush the grilled eggplant with honey-vinegar glaze. Add a dollop of chocolate-chip ricotta on top. 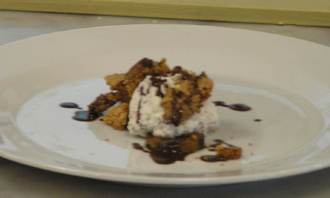 Crumble the fregolata over the eggplant, and drizzle with chocolate olive oil sauce. Method: Add sugar and water to a saucepot and make a simple syrup by simmering over medium heat until all the sugar has dissolved. Cool. Combine the lemon juice, water, and vodka with the cooled simple syrup. Pour mixture into a rectangular pan and place in the freezer. Stir ever few hours until it is slushy and breaking into irregular shards. Read about Chef Brooks Headley's class in the Gastronomy section.